I bought my first sewing machine this summer and I am so enjoying playing around with it! 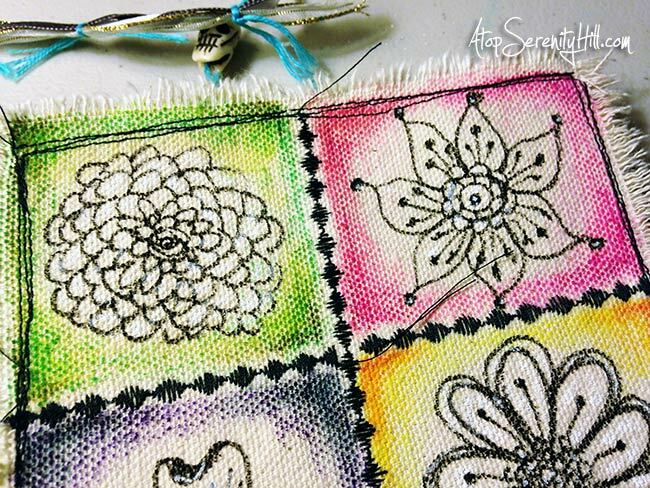 I got it mainly to sew on paper and canvas since I was loving all the elements I saw being added into art journals. The prompt for week 46 of the Documented Life Project was to incorporate fabric into your page, so I created a faux mini quilt that I glued directly into my Moleskine with Aleenes tacky glue . 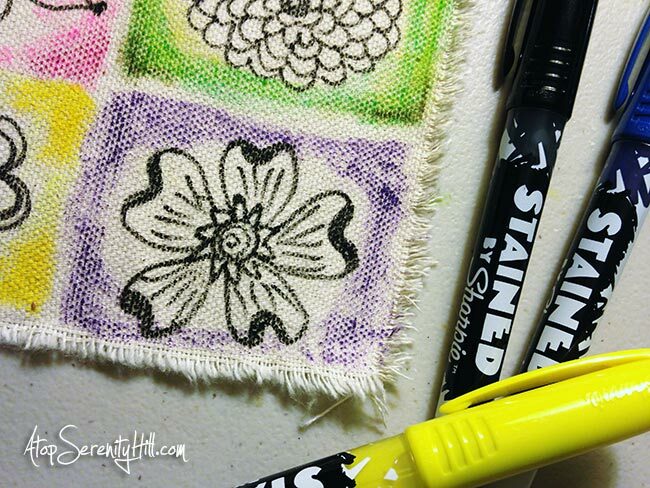 I started with a piece of unprimed canvas and added some colorful squares and doodled flowers using Sharpie’s Stained fabric markers . I then deepened the colors of the squares with Inktense pencils and a waterbrush . I tried adding some white highlights but none of my paint markers or white pens worked the way I wanted on the canvas. The white brightened a few areas here and there but not enough to make a difference. 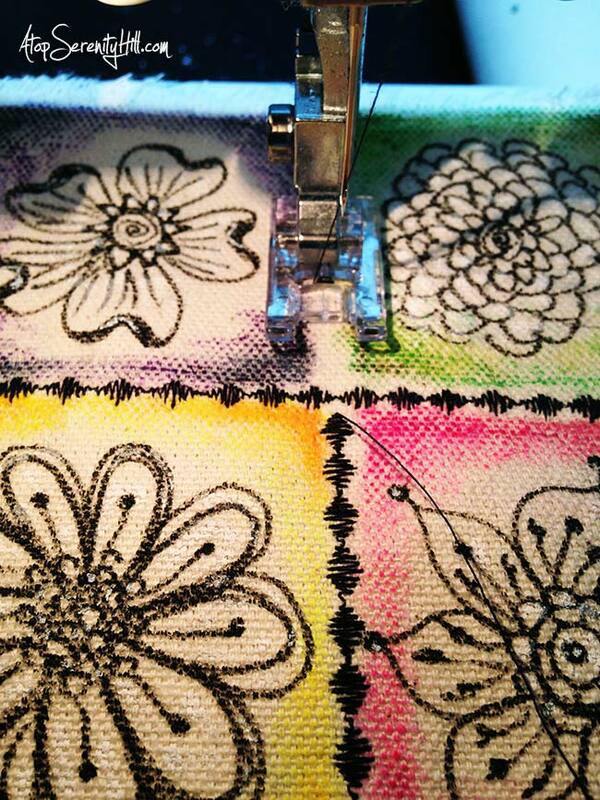 I then ran the canvas through my sewing machine using one of the “fancy” stitches to divide up the squares. The final step before gluing the mini quilt into my journal was to sew three loose rows of straight stitches around the outside. 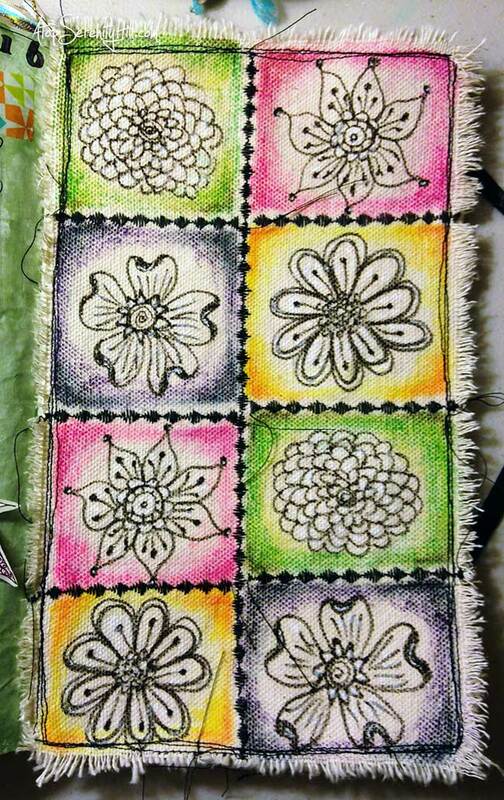 This stitching not only gives the quilt a border but will stop the canvas from unraveling anymore. I left most of my end threads uncut to add to the raw quality of the canvas. Love it!!! I have more canvas projects in the works that I hope to be able to sell in the near future…so stay tuned! Love it! Great idea for doing this kind of thing to put behind old glass windows — from the ReStore! This is great Consie! Experimenting with new mediums is fun isn’t it? this is fabulous!! That is a cool stitch you used too. My machine is over 20 yrs old and just getting me through. I’m actually hoping it stops working so I can get a new one with the free motion option and other cool stitches. Perhaps I’d sew more:) Happy PPF! 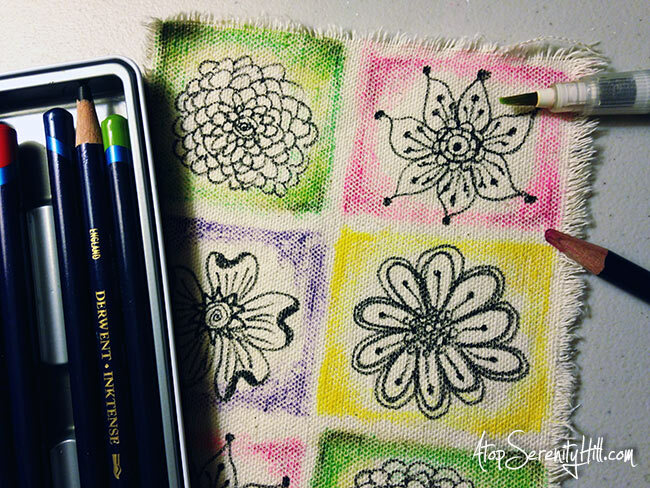 Oh, great doodled flowers too. What a fantastic mix of medias.